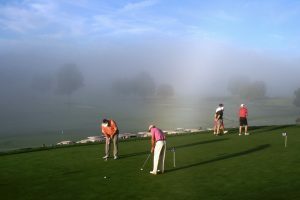 Morning fog didn’t stop participants in the 2016 Classic from getting in some putting practice before the 8:00am tee off. The Patricia Neal Golf Classic is a TPGA sanctioned pro/am event benefiting the Patricia Neal Rehabilitation Center in Knoxville, TN. Named for the late Oscar-winning actress Patricia Neal, who was a Knoxville native and 43-year stroke survivor, the Center is a 73-bed facility nationally recognized for its treatment of stroke, spinal injuries and traumatic brain injuries. The Center is dedicated to people with disabilities who are learning to become as independent as they possibly can.Over the last 33 years, this prestigious golf tournament has raised almost $6 million in net proceeds to support the many programs and services of the rehab center. The tournament brings Tennessee professional golfers together with amateurs from across the U.S. for a worthwhile cause at one of the state’s top courses.